Almost all the festivals in Ladakh are the annual monastic festivals. 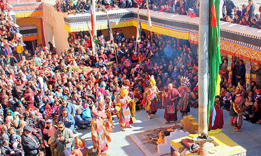 The monastic festivals are dance-dramas in the gompa courtyards. Among non-monastic events count the Losar or New Year celebrations and the notable Ladakh Festival organized by the Government. Preaching, principles, and teachings of Buddhism resonate in every nook and corner of Ladakh. This is also evident in Ladakh fairs and festivals as one can see the strong influence of Buddhism and they present an opportunity to the people to celebrate, interact with each other, form new bonds and renew the old ones. Designed with a purpose to rejuvenate and promote the depth, richness and pageantry of Ladakh’s centuries-old culture for worldwide appreciation and enjoyment, the Ladakh Festivals offer a unique opportunity to witness many of Ladakh’s traditions and folk heritage in a very short time and without having to traverse to its often formidable outlying areas. The festivals of Ladakh carry the rich, cultural and religious legacy of the ancient times. Most of the monastic conviviality go on for two days and draws the common masses as their spectators. 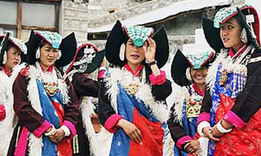 Some of the favorite festivals of Ladakh are Hemis, Thiksey, Karsha and Spituk Gustor. When it comes to the festival celebration, the most prominent one is Hemis Festival. Music and dance performances of Lamas dressed in colorful robes and wearing masks and recitals performed by the tribes keep participants and tourists entertained. It features various facets of the religion, one of which is the progress of the individual soul and its purification. Planning a trip during the festivals of Ladakh is a wonderful opportunity for the tourists to revisit the glory of Buddhism in India.